274 pages | 59 B/W Illus. Few institutions are warier of copies than museums. Few fields of knowledge are more prone to denounce copies as fake than the heritage field. Few discourses are as concerned with authenticity, aura, originals and provenance as those concerning exhibiting and collecting. So why is it that these are institutions, fields and discourses where copies proliferate and copying techniques have thrived for hundreds of years? 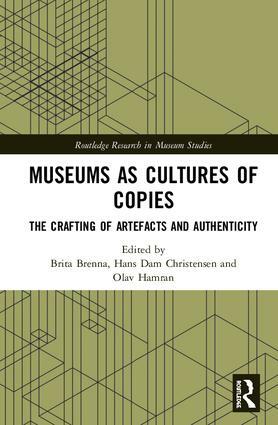 Museums as Cultures of Copies aims to make the copying practices of museums visible and to discuss, from a range of interrelated perspectives, precisely what function copies fulfil in the heritage field and in museums today. With contributions from Europe and Canada, the book interrogates the meaning of copies and presents copying as a fully integrated part of museum work. Including chapters on ethnographic mannequins, digitalized photos, death masks, museum documentation and mechanical models, contributors consider how copying as a cultural form changes according to time and place and how new forms of copying and copy technologies challenge and expand museum work today. Arguing that copying is at the basis of museum practice and that new technologies and practices have been taken up and developed in museums since their inception, the book presents both heritage work and copies in a new light. Museums as Cultures of Copies should be of great interest to academics, scholars and postgraduate students working in the fields of museum and heritage studies, as well as visual studies, cultural history and archaeology. It should also be essential reading for museum practitioners. Chapter 15 - Documenting museum objects: A practice of copying and a ‘copious’ practice? Brita Brenna is Professor of Museology and Head of Centre for Museum Studies at the University of Oslo, Norway. Hans Dam Christensen is Professor of Cultural Communication at the Royal School of Library and Information Science, University of Copenhagen, Denmark. Olav Hamran is Head of Research and Development, Arts Council Norway.